Around 30 members of the Scottish Genealogy Network gathered at Heriot Watt University on 24 October 2015 for our CPD day. 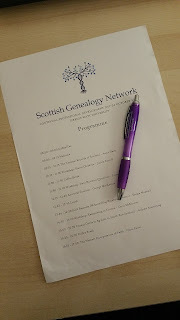 The SGN was set up a few years ago by just a few genealogists who wanted to get to know their fellow genealogists better and have a forum to network. We now have over 40 members, all of whom are based in Scotland and work in the genealogy field. Some research for individual clients, some are involved in publishing genealogy records, some teach others to research their own family history and others write for genealogy publications; some do a mixture of everything! On Saturday we began the day with a talk and discussion by Anne Slater of the National Records of Scotland. Anne was able to answer some questions that members had about records and give some insight into the future of the NRS. The group was left with confidence that the NRS are moving in a direction which will lead to greater and easier access to the records. 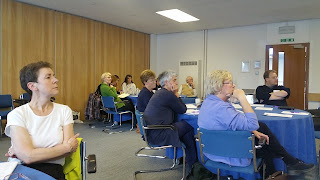 Next on the agenda was genealogist Judith Russell who led an interesting workshop on ‘Home Children’. Looking at one family's case to begin with, Judith showed how two boys from Scotland were sent to Canada in the early part of the twentieth century as it was deemed that their family could not care for them. She demonstrated how these stories could be researched using traditional sources and the records of the charities who arranged for their passage. The personal files of the children can only be accessed by family members but we as genealogists can help families access them. After a restorative coffee our secretary Emma Maxwell led the workshop on Business Questions. This section was designed to assist members who run a business. Some of the topics covered focussed on the challenges of advertising and getting repeat business. Most of the group agreed that advertising in printed publications often has very little return. We discussed ways to help each other as a group. After the business questions it was a pleasure to invite a new member to the floor, George MacKenzie, former Keeper of the Records of Scotland. George is the chairman of the Scottish Ancestral Tourism Group. Recent research has shown that Ancestral Tourism could be a huge boost to the Scottish economy. George highlighted the need to build local networks so that accommodation providers, tour operators, archives and genealogists can work together to give a wonderful welcome to ancestral tourists. After this exciting programme of morning events it was time to break for lunch and talk to our fellow genealogists. SGN member Lorraine Stewart will blog on the afternoon’s programme.